Munsiyari in Uttarakhand is a beautiful town nestled amongst the snow-capped peaks of the Himalayas. The scenic views are a well kept secret among mountaineers and trekkers who often use it as a base camp. But it is the women of Malla Ghorpatta, a village next to Munsiyari, who are the real jewels, given their amazing solidarity and sense of purpose. With this story we celebrate woman​hood with and for the women in this hinterland of India. A 150-hectare piece of land owned and managed by Malla Ghorpatta’s Van Panchayat (village forest council) is at the heart of this story. Most of the villagers here are directly or indirectly dependant on this land as they graze cattle here and collect dry grass to feed their livestock and sell as fodder. The villagers wanted to build a protective wall around this land under Goonj’s ‘Cloth For Work’ (CFW) initiative. They needed the wall to protect the land from grazing by wild animals, police horses and mules, which led to a loss of grass worth lakhs of rupees. The wall would protect the grass and establish the village’s unequivocal right over this land. But much more happened in the process as Goonj’s partner organization, Quantum Social and Educational Society (QUSES) played a vital role in bringing together and unifying all castes and communities of the village to a common cause. The details were collectively discussed and decided at a joint meeting of the villagers; the Sarpanch of the Gram Panchayat (head of the village governing body) and members of local institution Mahila Mangal Dal (Society for the betterment of women). Based on the common consensus the women decided to build a 750 meter long and approx. 1 meter high wall, in four sections around the grassland. 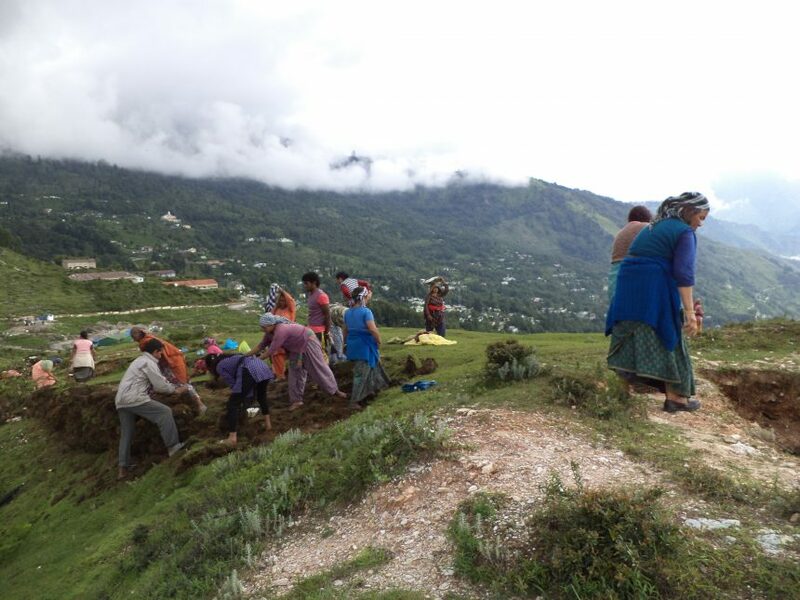 A tok (a ward of 15-20 people) of women worked on making different sections of the wall and every participating woman worked for at least 3 hours a day. Each tok was further divided into four groups with different responsibilities such as, digging mud, collecting stones, cutting bushes for the wall and making the wall. 72 women in total worked with this very systematic and disciplined approach in one of the toughest terrains and despite bad weather situations finished the dream task in 45 days. What evolved during this incomparable endeavor makes for an exemplary story. The wall making work had to be halted often because of the bad weather conditions such as heavy rainfall and sometimes hot sun beating down on the women, but they wouldn’t give up. They would sit under their umbrellas and wait for the downpour to stop, thus working for longer hours. They would sing folk songs, share folk stories and continue with their work, despite all odds. Women as old as 70-75 years also joined in digging mud and carrying rocks. Women heading the toks emerged as effective leaders, encouraging everyone to work in a united way to ensure that they finished this stupendous task on time, meeting the self decided standards of the villagers. As the work gained momentum, the arrival of Goonj material, the ‘Family Kit’, proved to be a big boost to the villagers. At the end, the people of Malla Ghorpatta had not only made a wall but also gained the strength of community unity and action. This also reaffirmed our belief that people are the best judge of assessing the nature of their problems and finding viable solutions. They have to just be motivated to come together, deliberate in a positive way and take decisive collective action. Team Goonj provided that motivation and supportive material that first started this process and then helped to sustain it. The people of Malla Ghorpatta, especially the women did the rest, taking their rightful place at the center stage. Interestingly, this was the first time three communities – Thakurs, Scheduled castes & Scheduled tribes came together to work on a common issue. “हम सामान के लिए ये काम कर रहे थे लेकिन काम करते करते लगा कि ये तो अपना ही काम है तो हमने ये काम और अच्छे ढंग से किया बिना किसी लालच के”– लक्ष्मी देवी, महिला मंगल दल (We started the work for the material but as we worked, we began to feel that this was our own work and we worked more diligently for ourselves without any greed for material – Laxmi Devi, Mahila Mangal Dal) Moving the focus from ‘self’ to the ‘common good’ is not so common and yet here in the remote foothills of the Himalayas these women did this uncommon.. so easily. Now, these women can not only feed their own cattle but also take out a substantial quantity of grass to sell as fodder. In the first year, after the wall was constructed, the ‘saved’ grass generated an income of approx. ₹ 70,000.. a figure that is only growing. The local units of calculation for grass is luththa and muththa. The women here tried to teach us how many muththas are equal to one luththa and how much does a muththa of grass sell for.. Doing some quick calculations to find the additional grass sold and money earned, we laugh with them as they come to the incredible conclusion that there is almost 2 to 2.5 times growth in the yield !